Super Critical by Green House Seeds is a strain that will reward knowledge and effort with some super yields of narcotic strong indica bud. Super Critical by Green House Seeds has it all on paper; she is the combination of some very powerful genetics (Skunk x Big Bud x White Widow), resulting in a indica dominant titan with a real knock-out effect. She also responds well to advanced growing techniques, and can output a great deal of bud. So how does she stack up in the grow room? 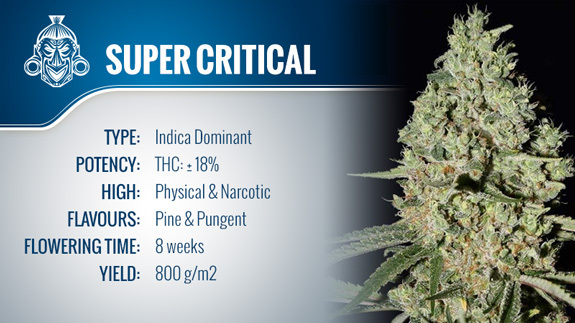 Super Critical is a cannabis strain with a lot to offer any grower willing to treat her right. We found she was pretty resilient to stress, but at the same time, would only put up with so much before making her displeasure known. As such, she is probably not suited to first time growers, but for anyone with a bit of growing experience under their belt, she will reward them quite nicely. Her ability to put up with a moderate amount of stress also made her compliant when it came to more advanced growing techniques, such as SoG and ScrOG. In terms of yield, Super Critical is able to produce anywhere up to 800g/m² depending on how she is grown. For us, she flowered in 51 days, although Green House Seeds say she can take up to 56 to come to full fruition. Outdoor growers will also need a little skill to really get the most out of her. However, the effort is said to be well worth it, with potential yields of up to 1200g per plant and a harvest time towards the end of October – although she will need a warm climate. Super Critical’s taste and aroma sit towards the earthier side of the flavour spectrum, combining pungent, woody and spicy tones into a pleasant and hard hitting smoke. As mentioned, Super Critical has a very indica heavy, hard hitting effect. 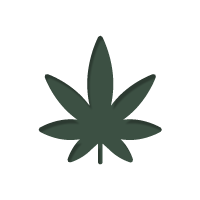 The narcotic relaxation is almost instantaneous, and the more you smoke, the deeper you sink. This lockdown potency may not be suitable for novice smokers unfamiliar with the unfathomable depths of the indica stone, but for those who love to plunge their body into complete and utter physical and mental relaxation, Super Critical is sure to be a favourite. As such, it makes her an excellent end of day strain, when everything is done and it is time to relax, or even sleep. On the whole, we found Super Critical to be an excellent strain. She is not quite well-rounded enough to suit first time growers, or be considered an all-star, but if you have a bit of experience with growing, you should be able to get some exceptional yields of very potent indica dominant bud. There is a lot of potential here, just make sure you treat her right.